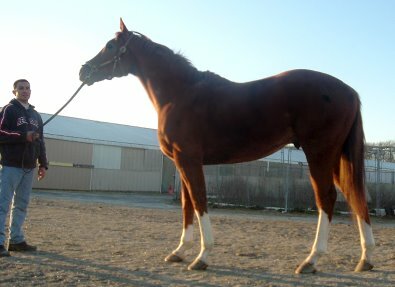 Admiration is sadly offered for sale by his owner due to the economy. 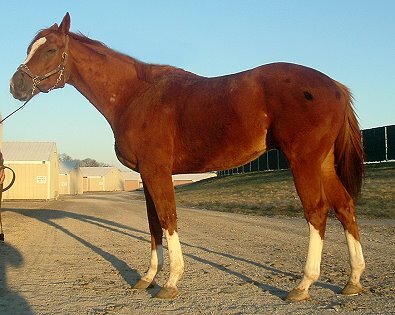 Admiration aka “Huey” is a 10 year-old TB gelding who has been off the track for over two years. 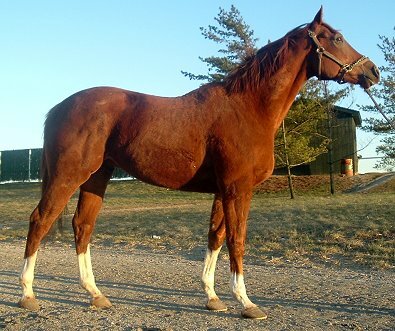 He is chestnut with four high whites and a blaze and stands 17 hands! 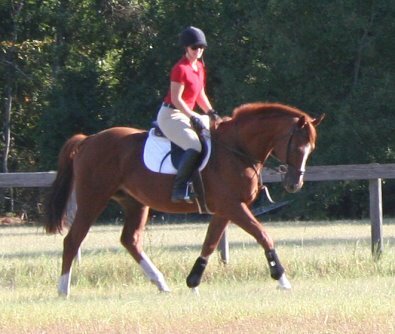 Huey is built like a warmblood – wide barrel, very solid bone. Very flashy! He is currently living happily on 24/7 pasture with bare feet. 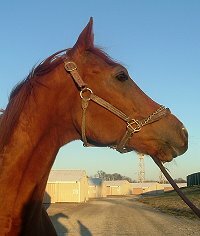 He has an old bow, but raced on it and retired sound, has not been an issue since coming off the track. This horse is very smart without being mischievous. 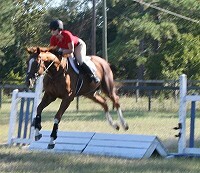 He loves to work and train, although he prefers riding out of the ring. 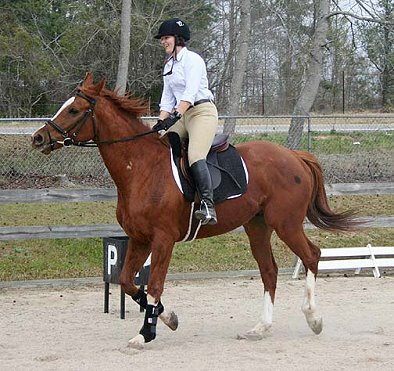 I think he would do best in a foxhunting or eventing home because he LOVES to be out to run and jump, and he’s pretty unflappable – my dog follows us everywhere, he’ll trail ride alone or in company with no problems. He just gets bored in the ring. 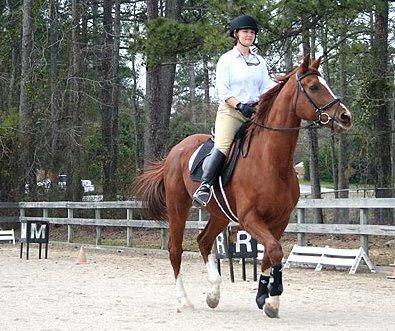 He also has the presence for dressage – a very “Look at me” attitude. 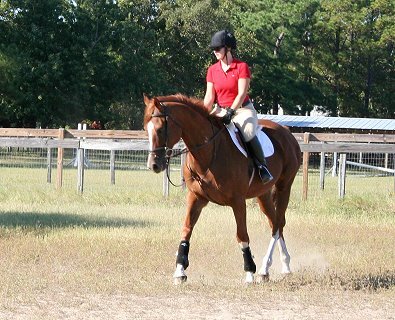 He goes in a hackamore whenever we’re not schooling dressage. Currently he schools dressage in a Myler snaffle. This horse has only refused one jump for me in the whole time I’ve had him, and I suspect it’s because his feet had been trimmed that day. 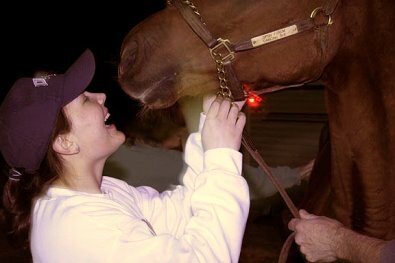 He has trained to 2’9″ including coops, brush, aikens, ditches, and banks. 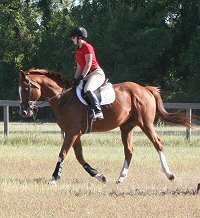 He has the ability to go higher – when he was first learning he routinely treated the small jumps like they were 3′ with no problem. 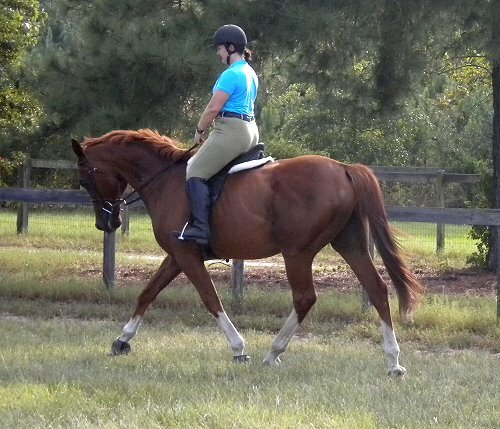 He has a lovely trot that is very rateable, and you can sit his canter all day – it is very smooth and rhythmic. “Huey” will gallop out readily without nonsense, and comes back easily. He has a huge sloping shoulder, and he is very athletic. He rides awesome from the seat and legs, and is beginning to really learn about mouth contact. He has a sensitive mouth, so would be best for an advanced rider. However, he’s very forgiving, and I think he would do well with a teenager that he could really bond with – if he trusts you, there’s nothing he won’t try. 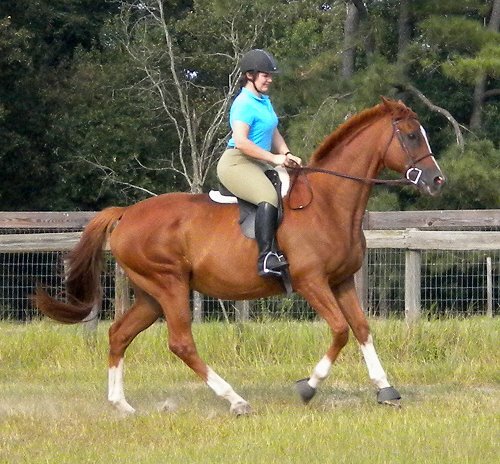 He could go to the right intermediate rider with a trainer. He is quiet enough that I have put children and non-horse riders on him just to walk around. Occasionally he can get fresh, but only when he hasn’t been worked in a while. 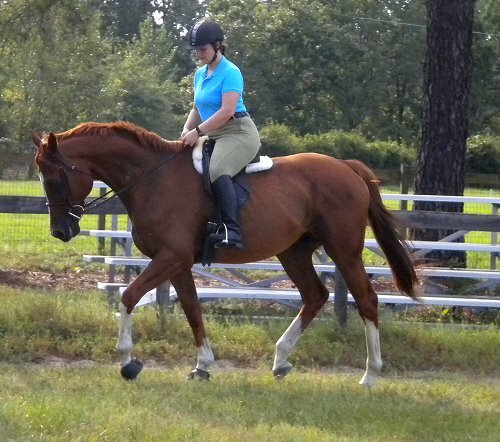 With a kind, competent rider there’s no limit to where this horse could go!! 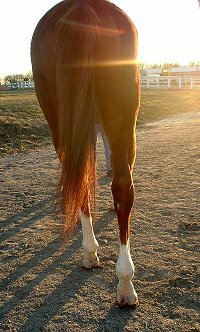 He stands for vet, farrier, chiropractor, dentist and trailers fine. Shots/Coggins were done in May; has been on rotational worming program, will be PowerPacked in late September; teeth were done in August. Up to date on everything and ready to go! Call for price – negotiable to the right home. 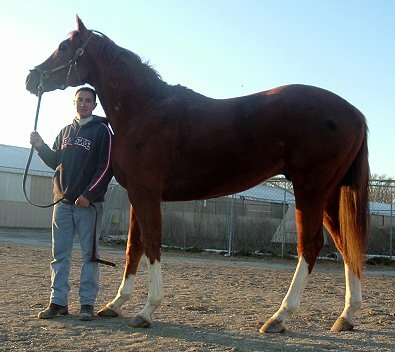 See Admiration’s pedigree here and read Admiration’s Success Stories.